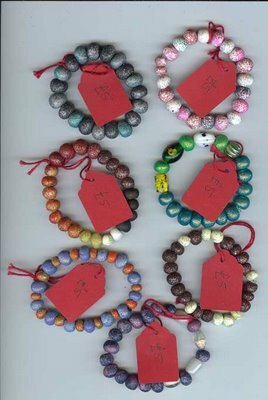 Here are some of the £5 polymer clay bracelets we have made, sorry about the red tags, we have been putting them on ready for the shops. Some of this range have glass beads as well, but they are all new ones, not vintage. Natural Attrill is to have an off shoot! Toby and I went on a workshop and learnt alot about designing, pricing, making (including how to sew invisibly!) Following on from this we have decided to have a separate small designer collection, named "Attrills", using silver, ceramics, hemp, felt, and vintage elements. They will be for sale at Makepiece, www.makepiece.co.uk, and direct from us, showcased in a new Attrills blog, but you wont be able to see them till the Autumn. Nautral Attrill (main branch !!) is busy, we have been making lots of new bracelets. Also, Val Hughes, www.valeriehughes.co.uk, is taking some of our creations to show a gallery in Bradford, so, fingers crossed for that. Our website is being built as I speak, so hopefully not long now till that is up and running. Following on from our "blogging and beads" post a while ago, here are 2 bracelets from a selection we have made to show to my friend who wanted a piece in orange or red. We made the beads ourselves from polymer clay and then we went button hunting to match up colours. Toby started this style last year, but didnt really make a profit taking into consideration time and materials, so we have put our prices up! Natural Attrill plain polymer clay bracelets will be £5 plus p+p and then rise in price depending on other elements, buttons, glass beads etc etc. In this picture the red one is £6.50 and the orange £10. Its so exciting opening up parcels! 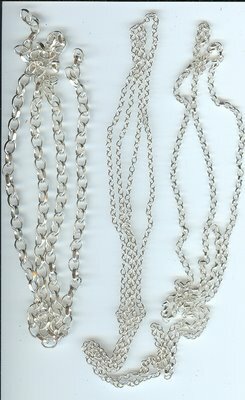 We now have solid silver chain, which we buy by the inch, all different size links for our creations. The postman came this morning with a package, Toby and I were tearing at the wrapping !! - it was our hemp, you can see in the picture the wonderful colours www.thehouseofhemp.co.uk We will use this probably in combination with our hand felted beads to make necklaces. Toby and I designed this logo which we will use for labels for our jewellery, not sure wether to make them ourselves or have them printed, if they are printed we would like them to look really good on handmade or recycled card perhaps, any recommendations? We scanned torn brown wrapping paper and found a handwritten font, called "barbies jelous sisters" at http://www.abstractfonts.com/ This style will also be used for our website, so its all coordinated. I had better go and do some "real" work, www.omniadesigns.com I am painting artwork for a christmas card, a commission from Hambledon Studios (wholesale side of Hallmark) As an illustrator I work in the name of Penny Johnson, my maiden name, incase anyone wonders why its not Attrill! 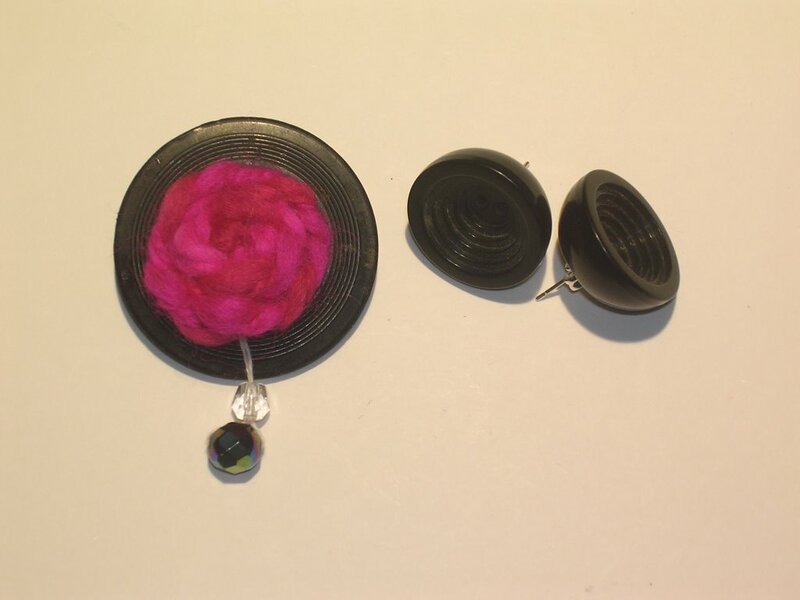 Here is a sneaky peek at one of the pieces to go on our website, it's the brooch Toby made with one of his wool plaited spirals, on an old black button, with 2 vintage glass beads hanging down. 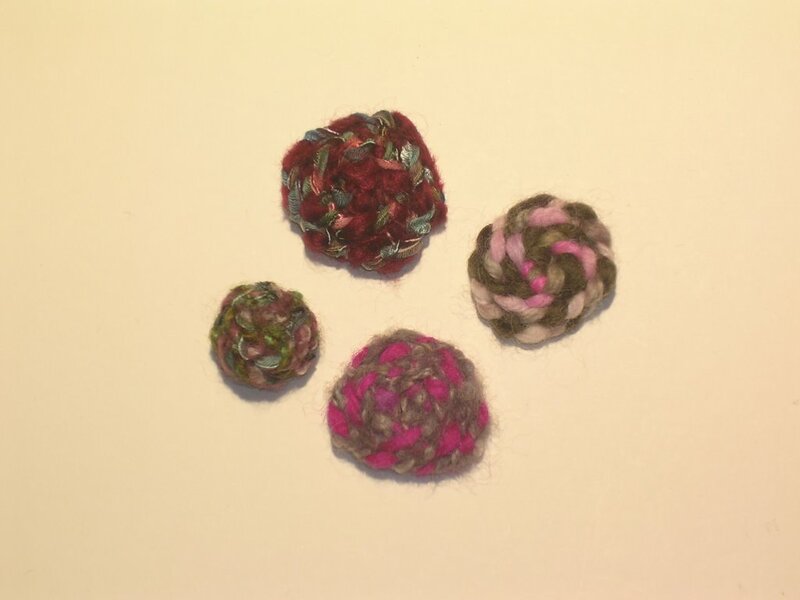 He has made a pair of earings to compliment it, and called the set "Vortex Rose"
Toby has been plaiting wools and ribbons and then spiralling them around and sewing them together. We have made one brooch with a spiral ontop of a huge old button with beads hanging down from it. 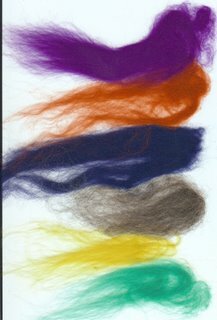 Here are some more spirals, we havent decided what to do with them yet, any ideas? 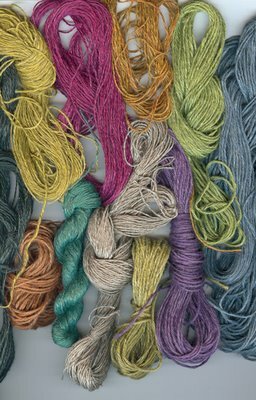 As well as collecting wool on our walks, we also buy wool tops in many colours and spend ages taking tiny strands of each, blending them together to create colour combinations to compliment our buttons and beads. 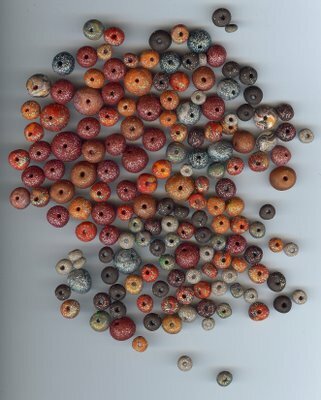 After we have mixed the shades we like, we felt it into beads and various shapes for our designs. 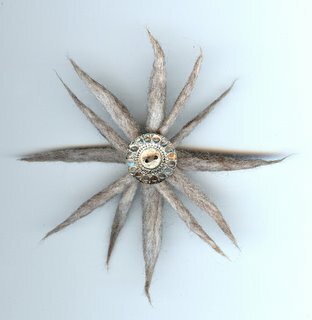 What makes this fun to do, and interesting to us, is that each piece we make is different, so every time someone asks us for a brooch for example, we can chat together about colours and shapes, maybe take a trip to an antique fair to find the right button, and come up with a unique creation, it never gets boring! Here you can see a brooch we made using our felt with a vintage glass button. Hi, I'm Toby and this is my blog too! 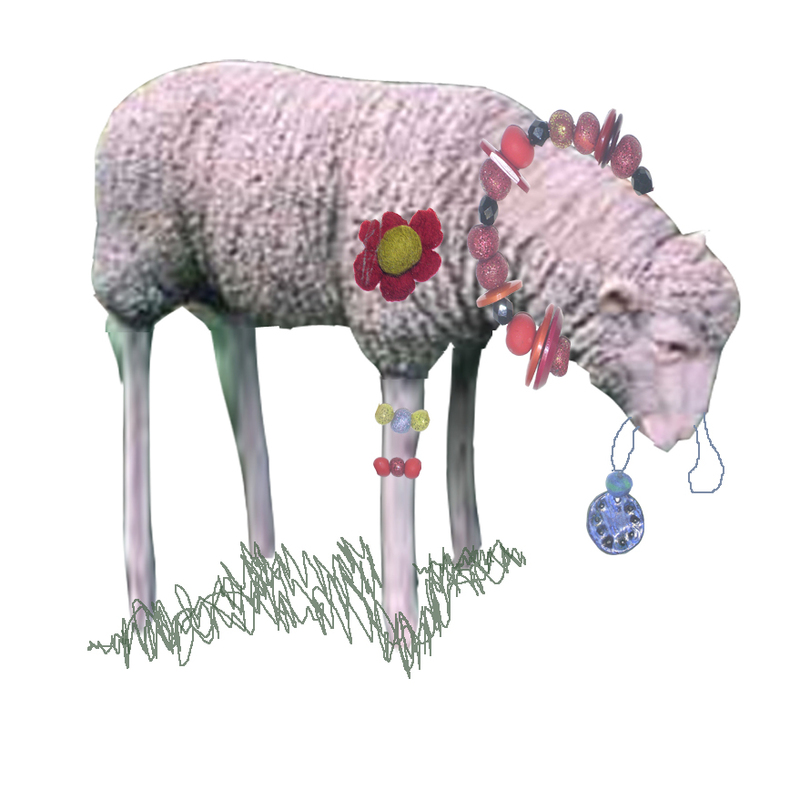 I created the sheep wearing jewellery using photoshop. I was going to leave this blog hibernating for a while but since a couple of friends have already linked it to theirs I suppose I had better start. Had an email from a friend saying she would like a bracelet in reds and oranges, so, I suggested that we make a few for her to choose from. Toby and I spent hours making various beads, rolling the polymer clay till our hands felt bruised! The following day Toby "holed" them all with a skewer, and I baked them in the oven. Next job is to sort out red and orange buttons from our vast collection, and adding them to felt beads, shells, or anything else red or orange that catches our eye, we will string up a selection of bracelets, price them, and hope she likes one. I am Penny, a freelance commercial artist working mostly in the greeting card trade www.omniadesigns.com and Toby is my son who is still at school, together we are "Natural Attrill" we collect and make things together. Soon we will have a website for our jewellery! Welcome to the blog of Penny and Toby!